If you like tangy flavored soups, you will love Sorrel Borscht (Shchav or Shavel). My first experience with tasting this dish was in a Polish restaurant, while visiting my family in Poland. My husband really liked the slightly tangy taste of this soup, so we have been preparing it during the sorrel growing season. The main ingredient is sorrel, of course, a simple herb/vegetable, but not easily found in a grocery store, but rather in a specialty food shop, or a garden (your own or your friend’s). You can find a ready made Shchav, in the Kosher section at your favorite grocery store, but it’s taste does not measure up to the fresh, home made version. Once you make it at home, you most likely will never want to buy it pre-made. Melt the butter in a large soup pot over medium heat. Add the celery and onion, carrot, and sauté, stirring, until the onion is softened, about 7 minutes. Add the scallions and sauté for another 5 minutes. Add the stock to the soup pot and bring to a boil. Add the potatoes, then reduce the heat to medium low and simmer, until the potatoes are tender (about 15-20 minutes). Whisk the flour with the heavy cream, until smooth (not lumpy). Add this mixture to the soup and bring to boil. Add the chopped sorrel and cook until wilted, 3 minutes. Add dill and chopped parsley, Maggi Seasoning, salt and pepper to taste. 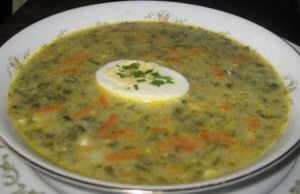 Serve in soup bowls, and garnish with chopped, sliced, or wedged, eggs, and a pinch of chopped dill. For a lighter version, you may use Half & Half cream, or milk, in place of the heavy cream. And replace butter with Canola Oil, and omit the egg for garnish. I like my borscht served with a chopped, hard boiled egg, because it really complements the overall taste, and enriches its texture. Thank you Busy Mom!!! I’m glad to hear that you cook with Sorrel as well. I served this soup to my 16 month old granddaughter and she loved it as well. Your recipe is the closest to my mothers that I have seen. I make a vegetarian version without broth and add spinach and leek for additional nutrition. This is how my mother-in-law, who was from Ukraine, made this borscht. I’m sure your recipe will be wonderful, because during lent I do make it with vegetable broth. Adding other veggies sounds good as well.